The Godfather is considered to be an American masterpiece, with a host of classic lines and catchphrases. The Godfather and its sequels remain some of the most widely quoted, imitated, and parodied movies of all time. The Godfather stars some big-name actors such as Marlon Brando, Al Pacino, James Caan, Robert Duvall, and Diane Keaton. Made in 1972, the movie was based on a novel by Mario Puzo. Together, Puzo, Francis Ford Coppola, and Robert Towne created the screenplay. Francis Ford Coppola went on to direct the movie. The movie won three Academy Awards in 1973 for Best Actor, Best Adapted Screenplay, and Best Picture and was nominated for eight other awards. The Godfather has been selected for preservation in the United States National Film Registry. It was ranked third on the American Film Institute's 100 Years…100 Movies list. In 2008, the list was published again and The Godfather came in second place. Set in the 1940s, The Godfather tells the story of a Mafia family. It opens with the lavish wedding of Vito Corleone's daughter, where Vito hears requests in his role as the godfather, Don, of the Corleone family. A few months later, Vito turns down a drug baron Sollozzo who wants help with his business. Sollozzo puts out a hit on Vito, but he survives. Although his younger son Michael has always kept himself out of the family business, when he discovers his father's life is still in danger, he kills Sollozzo. Gang war breaks out as Michael flees to Sicily. Michael's older brother Sonny is running the show now but is soon killed. An attempt on Michael's life kills his Sicilian wife. Michael then returns to New York and takes full control of the family after Vito dies of a heart attack. Michael then sets out to kill everyone who crossed the Corleones. The Godfather became a near-instant cult classic and as followed by two sequels. The franchise continues to be loved by many, studied in film classes, and revered by generation after generation. It's probably no surprise that a classic such as this produced popular catchphrases. Many of The Godfather quotes are instantly recognizable and continue to be repeated, even to the present day. The Godfather catchphrases have also been used in other books, movies, and television shows. Even board games such as Movie Scene It! also have fun with The Godfather quotes. Here are some of the most famous lines from all three Godfather movies. Someday, and that day may never come, I'll call upon you to do a service for me. A man who doesn't spend time with his family cannot be a real man. If, by chance, an honest man like yourself should make enemies then they would become my enemies. And then they would fear you. Everyone's got their own circle of sorrow. No Sicilian can refuse a request on his daughter's wedding day. I never wanted this for you. I work my whole life, I don't apologize, to take care of my family. And I refused to be a fool dancing on the strings held by all of those big shots. I spent my life trying not to be careless. Don't tell me you're innocent. It insults my intelligence and makes me very angry. Don't ever take sides against anyone in the family again, ever. All right. This one time I'll let you ask me about my affairs. I don't like violence, Tom. I'm a businessman; blood is a big expense. If anything in this life is certain, if history has taught us anything, it's that you can kill anyone. He was stupid. I was lucky. I want all of you to enjoy your cake, so… enjoy. This is the business we've chosen. Never let anyone know what you're thinking. Friends and money - oil and water. When they come, they come at what you love. He'd better be careful. It's dangerous to be an honest man. We should wet our beaks a little. Who knew something as common as, "It's not personal. It's business," can be linked to The Godfather? It's a common theme in all three movies and it's interesting to see how catchphrases could turn into everyday colloquialisms, even before the days of social media. The next time you want to wax philosophical, tell one of your friends, "Never hate your enemies. It affects your judgment." See if they're as keen on The Godfather catchphrases as you! "Godfather Catch Phrases." YourDictionary, n.d. Web. 26 April 2019. 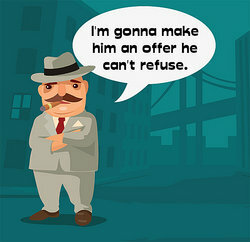 <https://quotes.yourdictionary.com/articles/godfather-catch-phrases.html>.